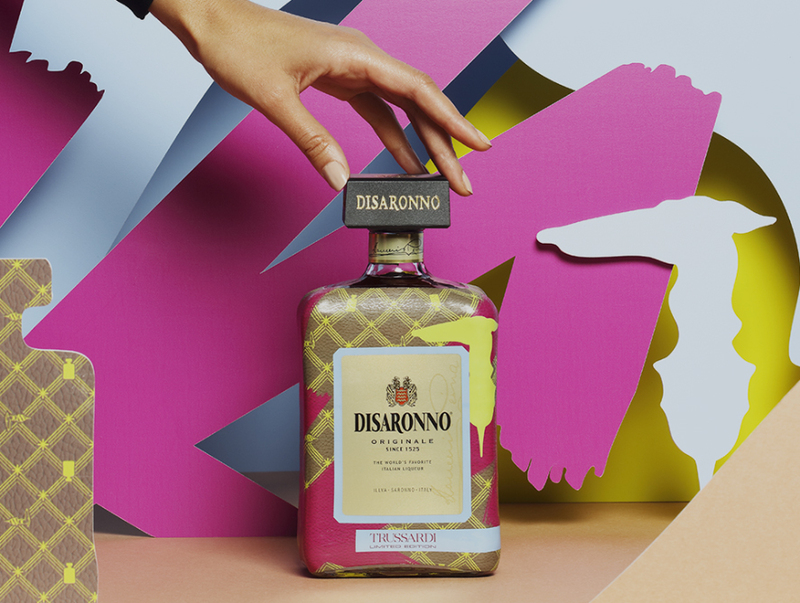 Disaronno embraces Trussardi’s symbols and colours to create the stunning new collector bottle. The sense of tradition, innovation and Italian elegance are some of the values the two brands share. They are values that emerge clearly in a Limited Edition where the typical Trussardi texture and greyhound logo unite with the Disaronno bottle’s distinctive shape, while fine fuchsia, green and blue brushstrokes frame the famous label. For a totally today result. First established in Bergamo in 1911 as luxury gloves manufacturer, Trussardi is recognized worldwide as a lifestyle brand known for its excellence, tradition and unique style. Fabrics and techniques innovation, together with attention to details, place the Trussardi Group at the centre of the contemporary fashion and design industry, with its two accessories and ready-to-wear lines, Trussardi and Trussardi Jeans. Always evolving, the brand portfolio has expanded with different product categories, such as sunglasses, fragrances, watches, childrenswear, bespoke menswear, and furnishing. The new Disaronno Wears Trussardi bottle is an ideal holiday gift for fashion aficionados. Also, it’s a great way to personalize the party scene with a luscious touch of colour and — most of all — a tasteful moment of pure enjoyment to share with friends. Along with the classic bottle, the Disaronno Wears Trussardi Limited Edition comes in two delightful sets of mini bottles, in packages of three, so they make great collector’s items. Lastly, there’s the “Celebrate in Style” gift box, with two champagne flutes joining the bottle of Disaronno®. Unique flavour, golden amber hue. Disaronno® has a distinctive aroma that has won fans of all ages, taking Italian style to many corners of the globe. Delicious both neat and on the rocks, Disaronno® is perfect for celebrating the holidays (at home too) with a smart new cocktail: Disaronno® Sparkling, a simple yet flavourful drink that consists of 1 part Disaronno® and 3 parts Prosecco (Italian sparkling dry white wine), with a currant sprig garnish. To keep updated with the latest from Disaronno Australia follow us on Facebook. For more information on Trussardi follow us on Facebook OR Instagram.